This is one of several photographs taken on a recent trip to Christchurch in Dorset. It is part of the entrance to the town’s famous priory. The priory’s original Norman structure dates back to the eleventh century – it gets a mention in the Domesday Book – but most of what we see today dates from the fourteenth through to the sixteenth century. The site is, however, believed to have accommodated an Anglo-Saxon church as long ago as the eighth century. Caught in the moody half-light of the porch, the stone varies in hue from a bluey-grey, to a pale brown, via a warm honey colour. 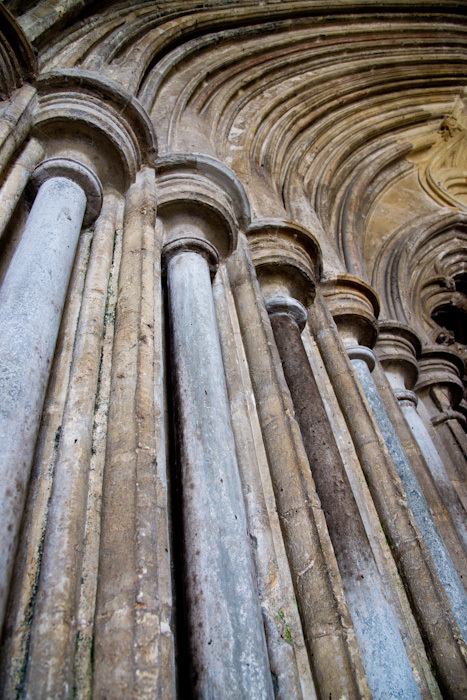 The centuries-old pillars give a sense of resilience and solidity. Here and there the masonry shows signs of wear, but such areas are few and what chips and erosion there are look like petty intrusions on the surface of something that was built to last for millennia, and probably will. For the technically-minded, the photograph was taken at ISO 400, f 6.3 and 1/40 sec.